Will British Columbia's craft beer craze spur a hop-growing renaissance? Cascade, Centennial and Goldings hops are three varietals planted in Persephone's demonstration hop yard. 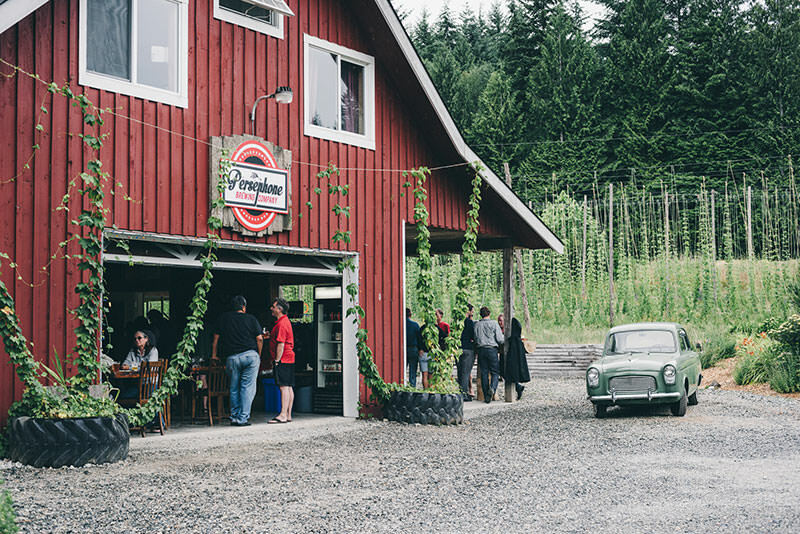 Persephone’s 11-acre plot is home to its craft micro-brewery and tasting room hidden inside a red barn-like building. Outside, hens poke around in their pen. 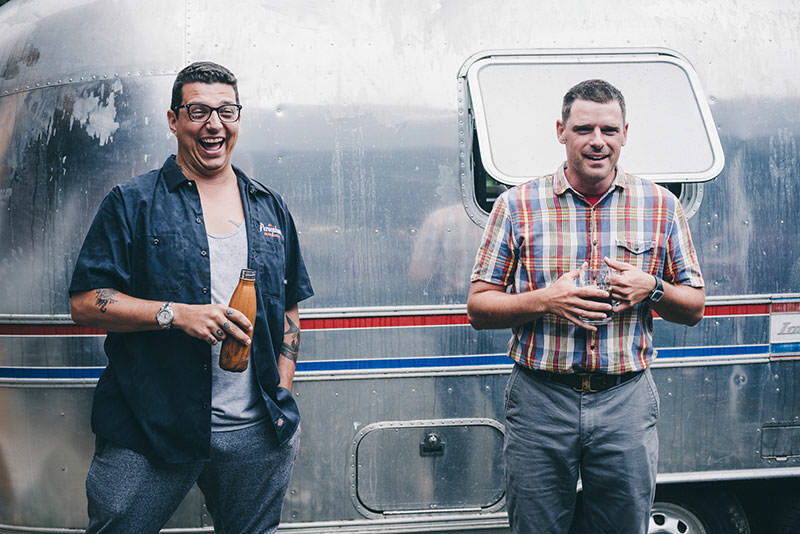 An Airstream trailer that doubles as Farm to Feast‘s food truck is parked in front of a pizza oven. On a stretch of land just steps away, spindly wooden poles are interlaced with zig-zagging cables and hundreds of feet of twine, like some new-age string art project. This is one of two hop yards on the farm. 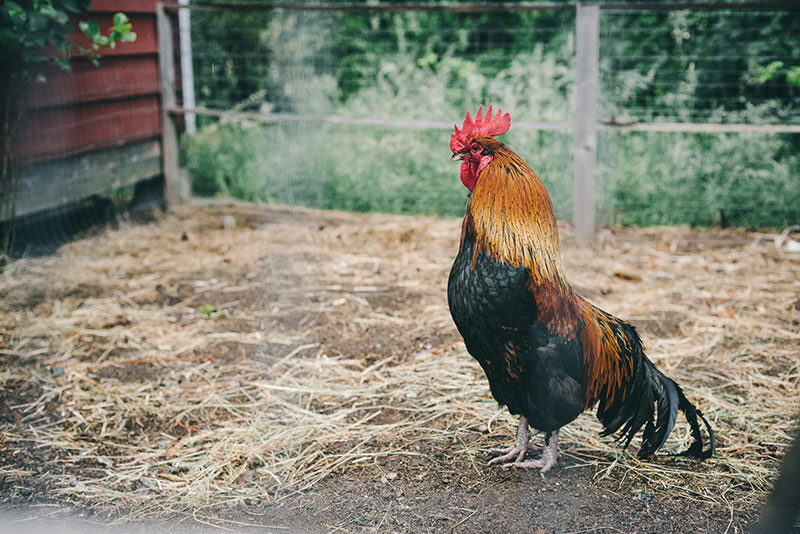 The chickens, hop yards, and building are all part of the farm brewery and certified B Corp that Brian Smith and Mark Brand co-founded in 2012. The pair had collaborated on other business ventures before starting Persephone, named for the log-salvage boat from The Beachcombers, one of Canada’s longest-running TV shows, which was filmed in Gibsons. That, and the goddess of spring bounty, who is working her magic on this unseasonably warm April day. Come summer, the tender shoots that wriggle up the twine trellises will grow thick and later produce the sticky cone-shaped flowers that give beer its bitter balance and aromas and flavors. “Cascade, Centennial and Goldings are in this upper yard. 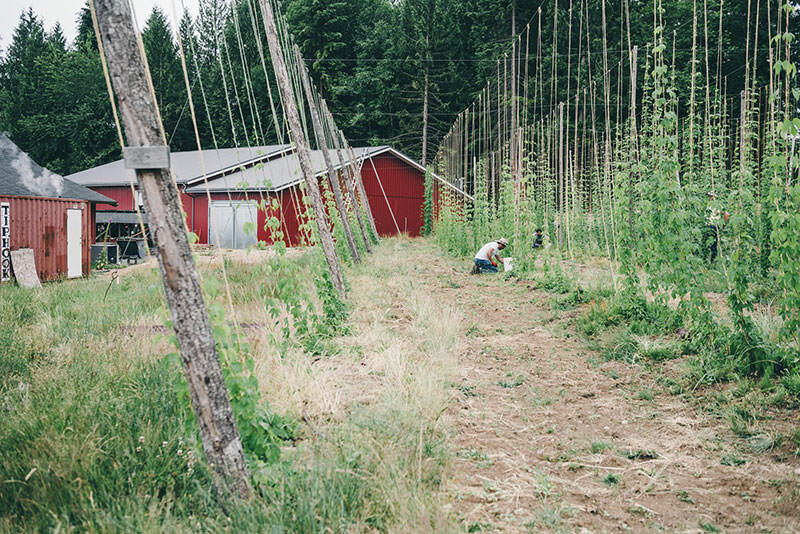 Down below, it will be mostly Cascade, Centennial and Chinook,” says Smith, pointing to a five-acre plot that will be planted with 4,000 hop rhizomes in early May. The plants will reach maturity in four years. The Goldings and “Big C” hop varietals, which are widely used in Pacific Northwest ales, were chosen by head brewer, Anders McKinnon, to create Persephone’s hoppy beers. A handful of breweries in Canada grow hops, in addition to using others grown in the U.S. and beyond. Persephone’s farm-to-bottle operation, however, is also a social enterprise owned by 45 individuals and organizations, including the Sunshine Coast Association for Community Living (SCACL), which provides services for people with developmental disabilities – many of whom work at Persephone. “Neither of us were farmers,” says Smith, who also works in economic development. Brand is a longtime restaurateur and barman. The serial entrepreneurs had successfully teamed up on social ventures in the past to bring food security to people living in Vancouver’s Downtown Eastside – arguably Canada’s poorest neighborhood. “Both of us had a very sincere and intimate connection to the idea of local food … and trying to figure out how small farms and locally grown food can become viable for us as consumers and our planet,” says Smith. He and Brand wanted to connect the brewery business model to an agricultural model from the start. They brought Dion Whyte, Persephone’s general manager and second employee (McKinnon was the first) on board in May 2013. 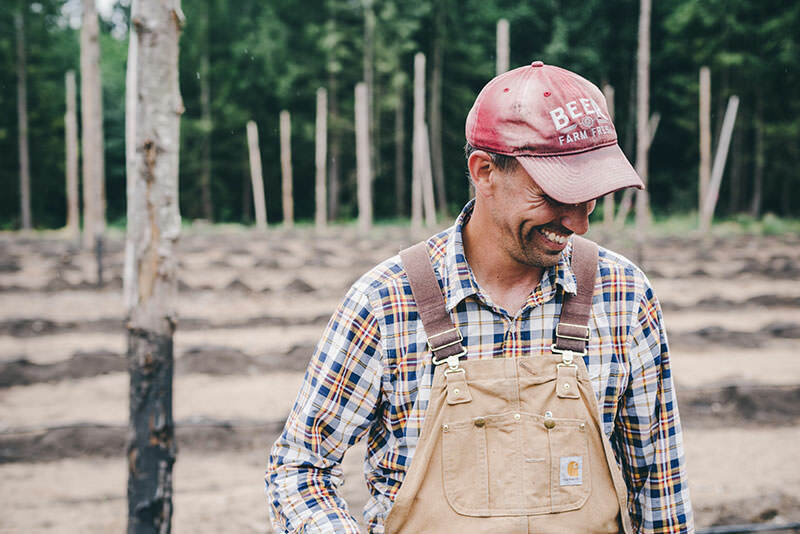 Whyte had already formed an organization of hop growers called the Hop Yard Collective, with the goal to produce enough hops to support British Columbia’s booming craft beer market. With the help of another staff member, he designed and built Persephone’s hop yard on the land that was once a flower farm. The entire Persephone team, clients from SCACL, and community volunteers planted the first crop of hops. Farming, however, isn’t exactly flourishing on the Sunshine Coast. Just 11 to 13 percent of the 9,600 acres in the region’s Agricultural Land Reserve is actively being farmed. Persephone hopes to help change that. It has received a grant from the B.C. Investment Agriculture Foundation “to do a study to see whether [growing] hops is feasible in this day and age, given what’s happening with craft beer in the province,” says Whyte. The funding also provides for education and outreach, like the one-day crash course in hop-farming Whyte led in early April. He covered everything from theory to getting dirty in the demo hop yard stringing twine and top-dressing the soil. He plans to lead future workshops and make the working hop yard more interactive. “We’re working on some interpretative signage so people can do self-guided tours and get a little information about hop growing, from both the operational and business sides,” Whyte adds. 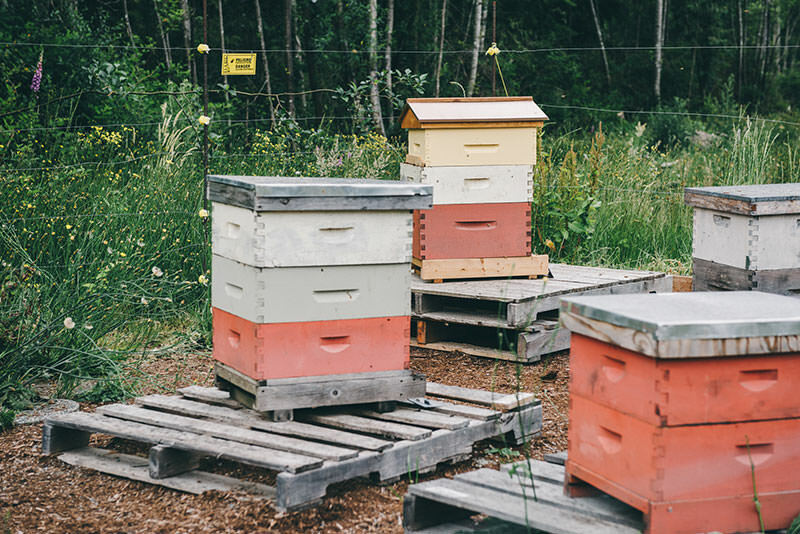 Part of Persephone’s business model included getting B Corp certification in 2015 by meeting strict standards in areas such as environmental and social performance. Getting certification was “second nature” says Smith, who credits Brand’s leadership in this area. “Our spent grain that comes out of the brew house gets mixed with mulch and becomes compost, which then amends our soil, which grows the hops that go back into the brewery,” Smith says, describing how wastewater is captured and remediated to irrigate food crops like the tomatoes that top the pizza churned out on-site.